Almond’s lilting, lyrical prose reproduces the magical, transporting music of the Orpheus myth. In this retelling, set in contemporary England, our narrator Claire shares with us the story of Ella, her lifelong, deeply loved best friend. Their lives are much like those of other teens until Claire, on holiday with some friends, encounters Orpheus, an ethereal young man who makes astonishing and enveloping music with his voice and his lyre. Claire uses a cell phone to share the sound with Ella, who falls passionately in love with the music and the musician. The intense love story doesn’t sidestep the inevitable tragedy; the soaring joy and devastating grief of young love ring as true today as they did thousands of years ago. Claire and Ella and their friends are bound by ties so strong they seem unbreakable. Then the strange and handsome Orpheus strolls onto the beach, and he sings them all into an astonishing new understanding of themselves. Ella is caught the hardest, fastest, deepest—and Claire is left with the pain of looking on. 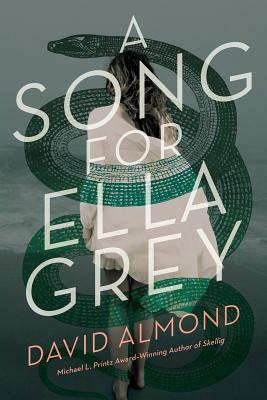 Raw, emotional, lyrical, funny, and true, A Song for Ella Grey is a tale of the joys, troubles, and desires of modern teens. It takes place in the ordinary streets of Tyneside and on the beautiful beaches of Northumberland. It’s a story of first love, a love song that draws on ancient mythical forces. A love that leads Ella, Orpheus, and Claire to the gates of Death and beyond. DAVID ALMOND grew up in a large family in northeastern England and says, “The place and the people have given me many of my stories.” His first novel for children, Skellig, was a Michael L. Printz Honor Book and an ALA-ALSC Notable Children’s Book and appeared on many Best Book of the Year lists. He wrote My Name is Mina, the prequel to Skellig. His novel, Kit’s Wilderness, won the Michael L. Printz Award for Excellence in Young Adult Literature. David Almond is a recipient of the prestigious Hans Christian Andersen Award. He lives in England. Visit him online at davidalmond.com and on Facebook and follow him @davidjalmond on Twitter.